It is 1930. Wall Street has just crashed, sea ice lingers in the Bering Straits, volcanos have exploded in Turkey and hurricanes devastate the United States. The mysterious ‘red weed’ has started to colour shores all around the globe. The Society for Investigative Researchers (SIR) has called for the world’s best and brightest to attend a symposium to try and address these natural disasters, among other problems. But the world has not long recovered from one World War - attending too are the players of the Great Game, the murky world of espionage that countries have to play or die. Are rumours of another World War on the horizon fearmongering or dire prophecy? Can such conflict be prevented or will personal vendettas bring down empires? And what are the rumours of dinosaurs really all about? 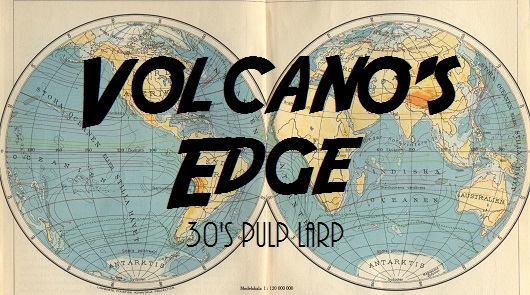 Volcano’s Edge is a one-off larp of politics and intrigue in the world of the classic pulp magazines. Explorers, scientists, spies and adventurers all vying to Save the World! It was written by Nickey Barnard, Steve Bassett, Dream Cloutman-Green, Sue Lee, Cat Tobin and Janet Young and has 33 player spaces. Character sheets are quite long - 10 sides of A4 are typical. Costuming appropriately is encouraged to add to the feel of the game. There are certain 1930s prejudices that are implicit in the character’s world views but they are not dwelt upon. Violence in character’s backgrounds does exist consistent with the pulp era, but is not graphic.